As another year draws to an end, here in the Goyo Travel offices we have been busy sifting through hundreds of photos our clients have sent in from their trips with us in 2018. It is never easy picking the best, but after much deliberation we have this year’s lucky winners. Thank you to everyone who sent in their fantastic photos, we’ve loved seeing them all. Why did we pick this photo? Camels are a popular choice for photographers, whether it’s a shot of them during a ride, stood by a ger, being transported in a flat-bed truck or by the dunes. What stood out to us with this was the more relaxing nature of the photo. 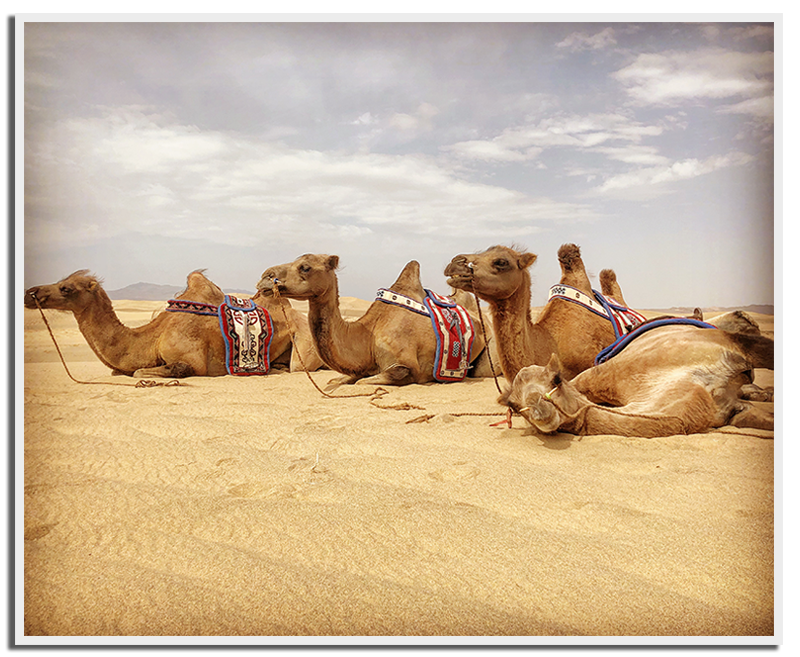 The camels sat down with the photo taken at eye level, the detail of the ripples in the sand, and the contrast of the golden sand and camels to the colourful, hand-made saddles. Congratulations Megan – you are the recipient of some ger-embroided Mongolian table mats! We don’t get many photos of horse tamers sent to us, which really drew our attention to this photo, capturing a more unique practise carried out in Mongolia. 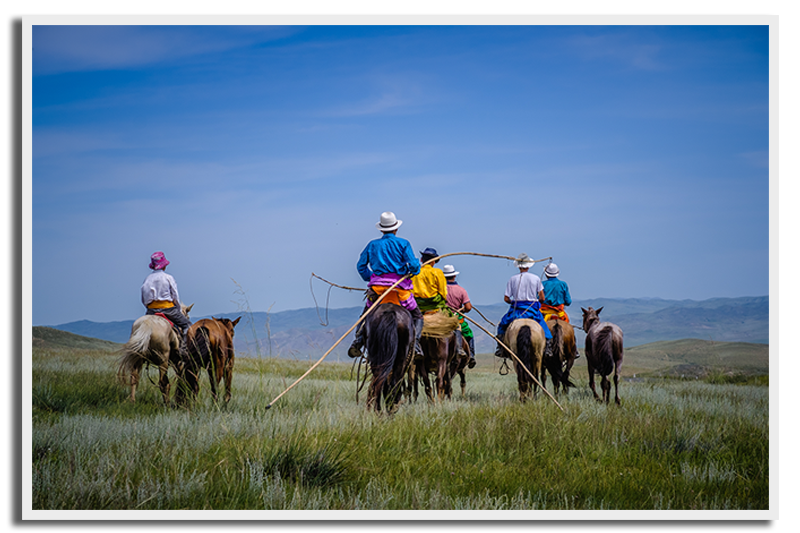 We loved this photo due it’s strong colours of traditional Mongolian clothing, the rustic authenticity of traditional horse catching poles, and the intrigue in to the adventure that these tamers were embarking on, as they ride into the vast central Steppe. Congratulations Pascal – with second place you will be receiving a traditional Kazakh wall hanging! “I particularly enjoy capturing images of people going about their daily life unaware of my presence and by sharing my photos, hope to inspire others to get out and see how others live. This photo was taken on day 8 of the 3 week tour excellently organised by the team at Goyo. We were visiting Tovkhon Monastery but were invited to lunch at a local yak herders ger. The owners kindly offered to saddle some horses for those not wishing to make the steep climb up the mountain. 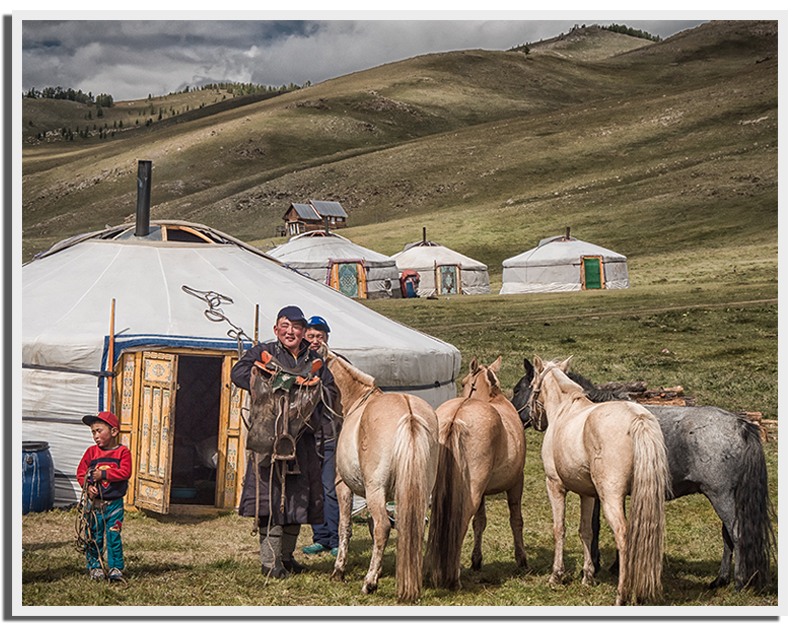 We receive an abundance of photos of Mongolian people and their gers, which made this photo even more special when it stood out from the crowd. As well as many other brilliant photos from Peter, he really managed to capture so much in one shot. Unlike many portrait photos we see, this image captured the head of the family in action saddling up his horse, an everyday task for many Mongolians. We also loved the dramatic skyline above the steep, rolling hills. This photo captured everything we love about Mongolia: friendly faces, nomadic lifestyle, affection for horses, and beautiful yet dramatic landscapes in one of the most remote countries on earth. Congratulations Peter – with our winning photo of the year, the intricately made Mongolian felt rug is yours! This entry was posted in Goyo Travel Photos & Blogs on 7th December 2018 by Goyo Travel.